Royal Ballet Principal dancer Francesca Hayward dances in a new underwater film choreographed by Charlotte Edmonds. In a new film, directed by Louis-Jack and choreographed by Charlotte Edmonds, Principal dancer Francesca Hayward is pictured dancing in an underwater studio to depict the struggle of someone suffering from depression. Edmonds, who trained at The Royal Ballet School, explained: 'Having started training so young, and starting a career at such a young age - there is a lot of pressure to succeed. I never wanted to let anyone down, especially myself. 'As an athlete and a performer, you become very critical of yourself, always striving to be the best you can be. When I was training, I went through some phases where I felt I had hit rock bottom - it certainly affected my self esteem and confidence. I found myself suffering in silence and never felt encouraged to speak out about my mental health. 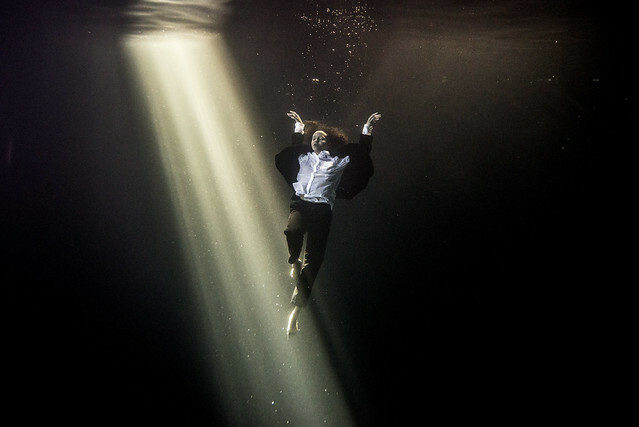 Before approaching the director, Edmonds had a clear vision the dance piece needed to be performed underwater. She took inspiration from a self-portrait by artist Ian Cumberland, which shows a fully-clothed man submerged in a bath. Both Edmonds and Louis-Jack hope the film will provoke conversations about mental illness, especially among young people and students. So beautiful, it made me cry. How can such a short piece be so beautiful, powerful, so dreadfully sad? Really excellent piece of work. Congratulations to all involved. Frankie looks superb; and I loved the music. This is simply WONDERFUL choreography and so perfectly expressed by Frankie Hayward. What a sensitive and expressive performance! What about her face in the last scene? Didn't that just sum up the whole ballet in exactly the right way? I'm SUCH a fan of this young dancer! Love the score and the concept.The water movement creates magic. Intensely moving. I will be recommending all my friends to watch the film. The atmospheric tone really mesmerises and with Francesca's beautiful interpretation to the music and water makes for a superb piece of ballet. What a beautiful way to help destigmatize depression! Thank you so much for creating this. It depicts so well how my patients describe their everyday life. I've only just begun to look into ballet and wow. Can I just say that this is definitely not what I expected, in the best way possible. I didn't know that mental illness could be expressed so acurately through dance. Maybe I'll show this to my parents so they can understand what I'm going through better. So moving and accurately reflected. I too was mesmerised and surprised at this amazing piece of choreography so sensitively and beautifully danced by our lovely Francesca Hayward. What a pity more people can’t have access to this incredible piece of dance. Where can I watch it? It's a great work with a big cause! Francesca is perfect for the role. It’s is a stunning piece in every respect and so moving. Beautifully filmed, beautifully danced and I love the merging of the dance in the water and earthbound. Congratulations to all involved. Breathtakingly stunning, that has touched me and left me speechless.